I’m hosting a delightful not-so-new writer today. Kate Moretti, who has offered some honest insights into author expectations and self-commitments. It’s a pleasure to meet you, Kate. 1. Kate – your book Thought I Knew You, was published nearly 18 months ago. Are you satisfied with your sales, and have you covered your costs? I am very happy with my sales. I won’t be hitting the NYT bestseller list anytime soon, but I’ve done pretty well for being with a small press. I think sales naturally go in a bell curve. At the height I sold a few books a day. I can’t speak to my costs because one of the great things about not self-publishing is that you don’t actually have any. A reputable publisher should never ask you for any money to produce your book. Now, if you’re asking if I’ve covered my own costs – that’s a whole different thing altogether! My publisher has paid for ad space on sites like book Bob, but I spend a lot of money on promotion, software, flyers, business, cards, bookmarks, refreshments for signings and book talks. I recently found that I enjoy taking online classes to hone my craft. Those can be a little pricey. So I definitely find that because I enjoy it, I have been spending a bit more money than I make. 2. Reviewers have compared your book with Jodi Picoult. It is a tremendous boost having a story spoken of in the same breath as a famous author. It happened to mine, when two reviewers of Breath of Africa mentioned Doris Lessing! Were you influenced by Jodi Picoult when writing yours? Absolutely. I lean towards deeply flawed or internally driven characters. I love when a writer can take a typically very unsympathetic character and situation and make the reader feel for them. That was always my hope with Thought I Knew You. That sentiment is a hallmark of Jodi Picoult. Her her latest novel attempted to do this with a Nazi. I am nowhere near that talented. Or that brave. So I always take these comparisons very tongue in cheek. It’s an unbelievable honor that anyone would make that comparison but whether or not I believe it is another story. 3. What marketing methods did you use – and what will you use for your next book? I use a combination of social media and good old fashion boots on the ground. I did a lot of local promotion: local bookstores, newspaper, libraries, church book clubs. For a while I called my father in law my booking agent. I spoke at the Italian American Club and the Exchange Club. I’ve also practiced some “out of the box” techniques, like leaving “book cards” in waiting rooms – local doctor’s offices, my dentist, even my tax accountant! I did a book signing at an art gallery, which had the biggest turnout! It’s been great fun. I’ve learned the fine art of marketing through connection. I’m a typically more introverted quiet person. Wanting to sell my book has pushed me out of my shell in a completely wonderful way. I always imagined marketing my book would feel slimy, like selling Amway. But it’s not all! People are genuinely interested, and many times talking about my book leads to just plain talking. Feeling genuinely grateful for the support I’ve received doesn’t hurt either. As for social media I’ve done all the usual channels: Twitter, Facebook, Goodreads, Pinterest. My book is geared towards a crowd over thirty-ish, so I do most of my online marketing on Facebook. I like using a fan page rather than a personal page to promote my writing. With a page, you can buy ads to boost engagement and many people will click the “Like” button before they’ll Add a Friend. My goal is to, of course, reach beyond my circle of people who know me and target readers from all over the globe. 4. Have you had feedback from book clubs in response to the invitation and discussion questions on your website? I’ve done about five to six book club talks. I love them! They’re so much fun. We used the discussion questions at a few of them, but others were more interested in the writing and publishing process. 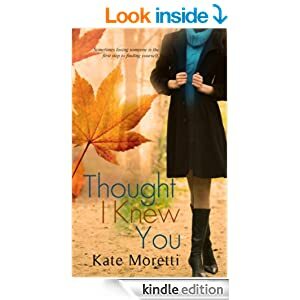 I have gotten feedback that the questions were a good discussion springboard from a few clubs that chose Thought I Knew You as their book of the month. Talking at book clubs is a tiny bit terrifying – I’ve had to hear about what my readers think of my characters face-to-face, which is not always kind. It’s not always easy. I smile and nod, but sometimes, I wince. I resist the urge to say “NO! You’re not getting it!” I try to remember that once your book is out there, it’s no longer “yours”. It belongs to every reader. Their interpretations are as valid as the words you wrote. At least this is what I tell myself. 5. You have a new book coming out in April. What can you tell us about it – and are you using the same publishers? My second book, Binds That Tie, will be out the last week in March. I’m so excited to release this book. I’m learning as I go with writing, and Binds has more character development, more complicated relationships. It’s very different than Thought I Knew You although, again, I try to take on unsympathetic characters and make the reader identify with them. 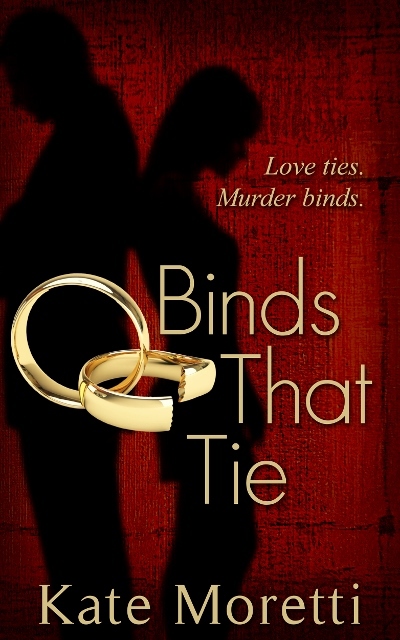 Binds That Tie is about a married couple that accidentally murder a man. Instead of calling the police, they bury the body. The story is about what that does to them as individuals and also as a couple, as they try to evade the police investigation. It’s much darker than Thought I Knew You. Yes, I am using the same publisher. I’ve been very happy with Red Adept. They have fantastic cover art and impeccable editing, they pay for advertisement, and set up a 20 plus blog stop tour. I took a gamble with them – they were brand new. Thought I Knew You was their second book out! Their catalog has grown exponentially and they continue to put out high quality contemporary fiction through ever expanding distribution channels. I tend to find that most small presses stick to Amazon, or KDP Select, and I like that my titles can be found at Kobo, Apple, Sony, Barnes and Noble. That being said, I do not think my works reaches as many readers as the “free runs” on KDP select. I can see where that would be extremely beneficial, especially in a debut novel, in getting your name out there to really get that ever elusive “word of mouth”. 6. How do you balance your work / family life with your writing – do you keep to a timetable, or write when the muse strikes? This is probably my FAQ! Truthfully, it’s always a struggle. I can’t write at work, even on my lunch break. I just find that I can’t turn my brain around that fast. But I have an hour and a half commute and a Bluetooth, so I dictate a lot. I correct all my dictation on the weekends. I try to sit down one day weekend and write for 3 to 4 hours at a stretch but that’s getting increasingly difficult, as my kids age into the world of extracurricular activities. Luckily I have a supportive husband who doesn’t mind taking over for this time. Or at least he pretends he doesn’t. I’m very lucky that when I sit down to write I can write really fast. I find that if I think about my plot all week and dictate notes, in that three hour stretch I can bang out 3K words pretty easily so I get out about a chapter a week. Things like editing and promotion get in the way of drafting, so it can take me a year to draft a work in progress. I used to feel frustrated by what seemed like lack of progress. I’ve accepted it, and I can’t give it any more time than I do. I need to reserve most of my weekends for my kids and most of my work week for my job. My mind however is always writing. will get there… one day). I did most of my traveling before kids, obviously. It feels false to say I currently love traveling. Right now with little ones, ages 3 &5 traveling to the grocery store is exhausting. I remember loving it, though. My husband and I have been to Italy twice. When I was in college I backpacked Europe for two months which was amazing. Greatest experience of my life. Asking about my favorite places is much like asking about my favorite books – it depends on my mood! I loved Rome, Budapest, and Dresden, Germany. 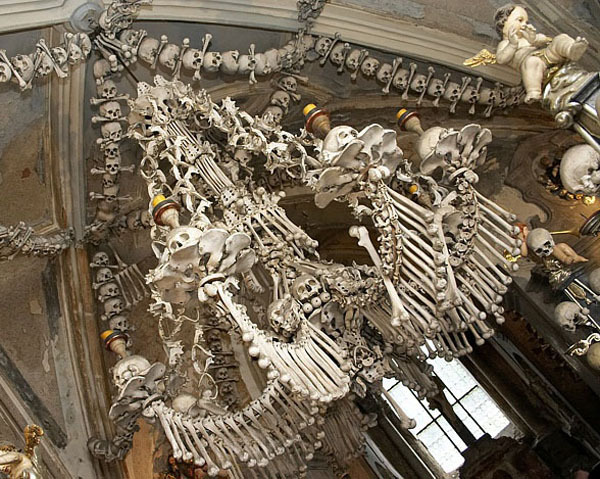 The craziest thing I ever saw was a bone church (ossuary) in Kutna Hora, Czech Republic. Those are human bones! (Victims of the plague). I need to write it into a novel someday, for sure. Inside the United States I’ve always loved Boston. To me sitting in Fenway Park eating a hotdog is a cornerstone of American culture. But I still think my favorite city, maybe in the world or at least that I’ve seen, is New York. I can’t explain it, it’s just always been a place I feel at home. 8. You say your dream is to buy an old house with a secret passageway. What would you do in this secret place? I have absolutely no idea. I’ve never been asked that question before! For me the great fun would be finding it. I’ve literally had this dream my entire life. As a kid, I used to search my parent’s house knocking on walls, looking for unaccounted for space. I have a wonderful recurring dream where I’m twelve again and I finally find it. In my dream it’s hidden behind the bookcase, just like in the movies, and it opens into the biggest slide I’ve ever seen. For a few seconds after I wake up, I have this impossibly young euphoria. It’s such a double-edged sword, this wonderful recapturing of childhood, that carefree lightheartedness because it’s soul crushing when you realize, oh yeah, the mortgage is due. 9. You claim to be an “overanalyzer.” Care to elaborate? I’m a scientist by day and a writer by night. I can’t think of any hobby or profession that would hone a natural tendency to scrutinize more than this combination. In my personal life I spend my time analyzing my children. When I blog which isn’t very often, I lean towards blogging about parenting. The scientist in me likes things to fit into neat little boxes and for there to always be an answer. The incredibly complicated layers of childhood make this impossible and gives my mind endless fodder for analysis. I have a tendency to self-reflect. If I had to put my priorities on my life, happiness and self-fulfillment would be number one. I feel very strongly that if you can find contentment for yourself (any mother will tell you this is practically impossible), then that found happiness reaches out words towards your husband and your children. I think motherhood can be consuming, to the point that many women forget themselves. I analyze this a lot – if I’m stressed or unhappy, what are the root causes and how can I fix it? 10. What has been the proudest moment of your life so far? Pride is a funny emotion and I haven’t quite learned how to wear it. For me the proudest moments of my life so far have also been mixed with terror. Without a doubt, publishing a novel is right up there. It’s probably the only thing I’ve done deliberately for any length of time, determinedly. I know I should say my “proudest moment” is childbirth, and it was a great moment, don’t get me wrong. But I don’t think I felt a lot of…pride. Exhausted? Yes. Overwhelmed? Yes. See, once you decide to have a child you make that decision once. For the next nine months I’m quite sure that if you asked any pregnant woman if she would undo it at least half of them would say (at least once) “Yes! Here! I’ve made a terrible mistake! Give me back my body, and my mind, and my unswollen feet!” But you’re on that train, no turning back now. Writing a book is making that decision to continue every time you sit down at the computer. This deliberate, plodding, pushing it into the crevices of your life. There’s no happenstance there. There’s no “oops, I did this, gotta see it through.” So yeah, I’m a bit more proud of my books than I am of the fact that I was able to birth a child. Although I can see this answer already changing, when I watch my five year old dig for change to give the Salvation Army bucket, pick up garbage on the ground to put in the garbage can (the whole time grumbling about “litter!”), or quietly help another kid in her class, with no expectation of recognition. I can see how “making people” is more deliberate than “making babies”. I’m quite sure that the proudest moment of my life is yet to come. Thankyou for coming, Kate – that has been a most interesting and informative interview! This entry was posted in Authors and tagged Doris Lessing, Goodreads, Jodi Picoult, Kutna Hora, marketing. Bookmark the permalink. Reblogged this on Cresta McGowan.